Ashley Schwader is a certified personal trainer through ACE and a certified Pilates and group instructor through AFAA. Her background includes personal training, nutrition, weight management, corporate wellness, and health promotion. She earned a Bachelor of Science in health and exercise science, from Colorado State University. IBS, or irritable bowel syndrome, causes you to drastically change your diet because of unpleasant symptoms associated with certain foods. Because of this change in diet it is important to make sure you are receiving enough nutrients, fiber, and protein. You can find these nutrients in soy, and it is a good choice for people with IBS. If you suffer from IBS be sure to speak with your doctor before changing your diet. With IBS, the muscles in your large intestine contract faster or slower than normal, causing pain, cramping and a change in bowel movements, explains the University of Maryland Medical Center. IBS is common in teenagers and adults and affects twice as many women as men. IBS has no specific cause, but common theories point to stress, disturbance in muscle movement, and diet. Ten to 20 percent of the population suffers from IBS at one time. This condition should always be diagnosed by a physician. Cramping pain in your lower abdomen, bloating, gas, and diarrhea or constipation are all symptoms of IBS. You might also have the feeling that you have not finished a bowel movement or you might see a white mucus in your stools. To help minimize these side effects you should restrict alcohol, caffeine, chocolate, red meats, and dairy products. Reducing saturated and trans fat along with increasing healthy cooking oils and fiber can also help with IBS side effects. Soy is a plant found in Asia that is part of the pea family. Soy and soy products, like tofu, contain protein, isoflavones and fiber. These nutrients provide health benefits including a reduction in cholesterol. Soy is also an excellent source of dietary protein, including all essential amino acids, according to the National Institutes of Health. Other products containing soy include tempeh, tofu yogurt, soy hot dogs, miso, soy butters, soy ice cream, soy milk, soy yogurt, soy cheese, bean curd, seitan and soy noodles. Reducing red meat consumption is a recommended for people suffering from IBS so it is important to find a healthy alternative source of protein. The University of Maryland Medical Center recommends tofu as an option for patients with IBS because of its high fiber and protein content. Ideally an adult should receive 50 to 175 grams of protein per day. 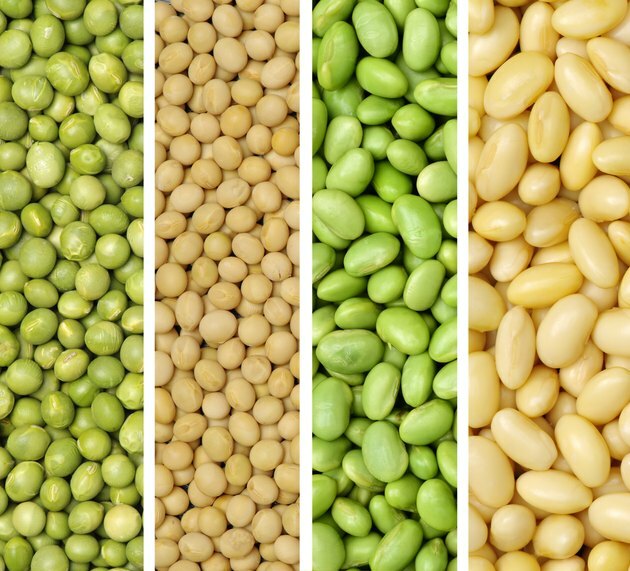 If you suffer from IBS and are worried about protein absorption, try adding soy products into your daily diet.